TL 8-10-12 mm plus; alitrunk profile convex in a smooth elongated curve, propodeal declivity not or poorly separable from dorsum, if the latter always much shorter than dorsum; petiole scale of major cuneiform, with convex anterior face and quite sharp dorsal margin; mostly bicoloured with alitrunk lighter and distinct light areas on gaster; dimorphic (?) minors with head narrowed posteriorly but not dramatically so and without any "neck". Type location Tanzania (Camponotus Kersteni n. sp., Gerstäcker, 1871: 355, minor worker; Santschi, 1914b: 131, major worker, queen & male) collected at Mt. Kilimanjaro (in German East Africa, thus wrongly given as Kenya by Bolton, 1995) (see Bolton, 1995) . Gerstaecker's (1871) description is at . Forel (1899b: 309) gave comments on the status, these are at . 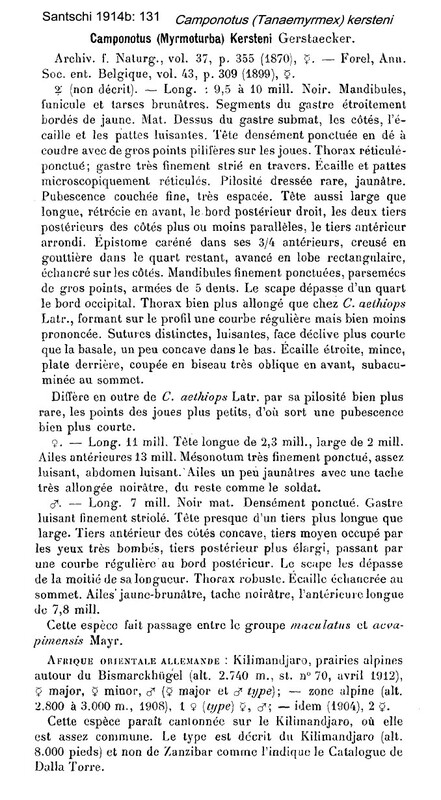 Santschi's (1914b) description of the major, queen and male is at . Wheeler (1922) listed it (as a subspecies of Camp. maculatus) from Tanzania, Mt. Kilimanjaro, at 2740-3000 m). Bernard (1952) wrote of two examples labelled "Nimba, Lamotte", from Guinea, adding known only from eastern Africa and Sudan. 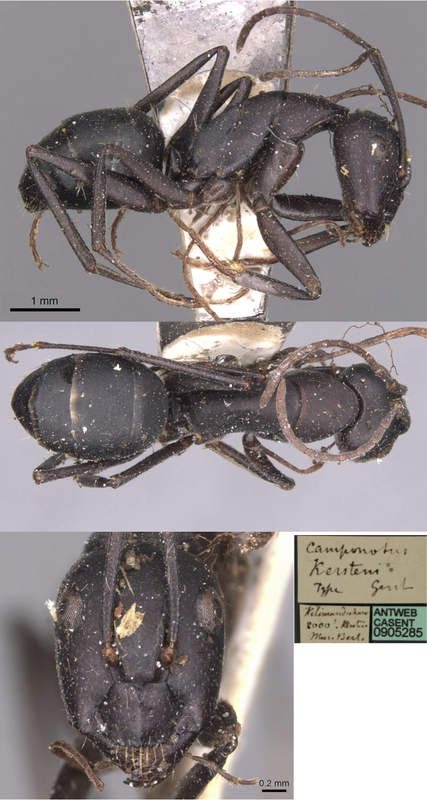 The photomontage of the type minor worker is collated from http://www.antweb.org/specimen.do?name=casent0905285.